I am the proud owner and creator of a vision board. The modern idea of visualizing your wants and desires using the law of attraction became popular with the release of the novel and film The Secret by Rhonda Byrne (and her appearance on the Oprah Winfrey Show). However, the method of using images as a tool used to help clarify and maintain focus on a specific life goals has been around for centuries. A vision board is simply a board on which you place images that represent what you want to be, inspire you to do whatever fulfills you and motivates you to pursue what it is that you want in your life. 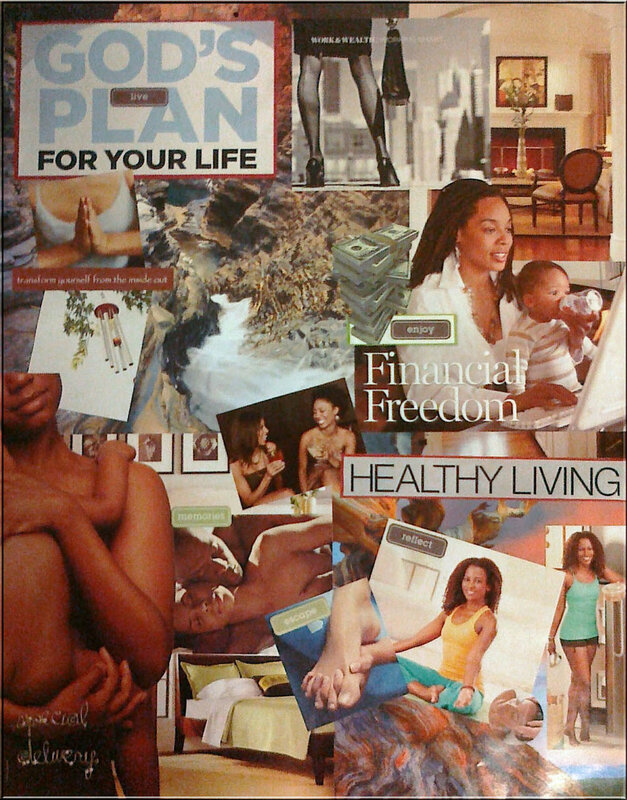 I created my first vision board in 2011 and it was a very spiritual experience. At the time, I wanted a new job, stronger connection with God, to take better care of myself, and a baby. So, I gathered a group of my favorite soul-sisters, and began the process of choosing images from magazines and placing them on my board. I displayed my board prominently on my bedroom wall where I could see it multiple times a day. What happened after that – not immediately, but soon enough – was astonishing… I became pregnant and got a new job. Needless to say, I was hooked! Now every year in January, the girls and I get together with food, adult beverages and a heap of magazines, and set our intentions for the year. If you belong to Pinterest, you are manipulating an electronic vision board on steroids. While your boards at the social media site are fun to create, having 1000 pins isn't going to help you to focus on one or two important goals. It is too overwhelming. Similarly, a board which is not pleasing to the eye, may keep you from focusing on those goals. Choose a variety and good quantity of magazines that reflect you and your desires. Don’t let your board get cluttered. Use colors and materials pleasing to your eyes and touch. Make your vision board your own. Not only should your board reflect your unique goals, it should also reflect your style. Any kind of board, try a cork board or poster board, and a frame. Scissors, tape, glue-stick, pins and gel pens. Embellishments: stickers, tags, letters, ribbon and other 3D accents. Photos, quotes, affirmations that inspire. Time and Space. It can get messy and take a while. Keep it in a place where you can calmly reflect on it. Make sure you will walk by it and ponder it frequently. Update your board regularly. I revise mine once a year. Remember, making a board is not the last step in the process, but the first. So, make sure to put effort and hard work into your goals after creating your vision board. By meditating, praying, and talking in the presence of your board, you will find the inspiration to work harder, save more, create often, and obtain the goals that are most important to you. The board alone won't accomplish your goals, but a board combined with you and your will power can do amazing things.